DO NOT submit maps that you didn't create yourself! VGMaps > General Boards > Mapping Tips/Guides > Topic: DO NOT submit maps that you didn't create yourself! I would just like to remind everyone that they are to only submit maps that they themselves have assembled. 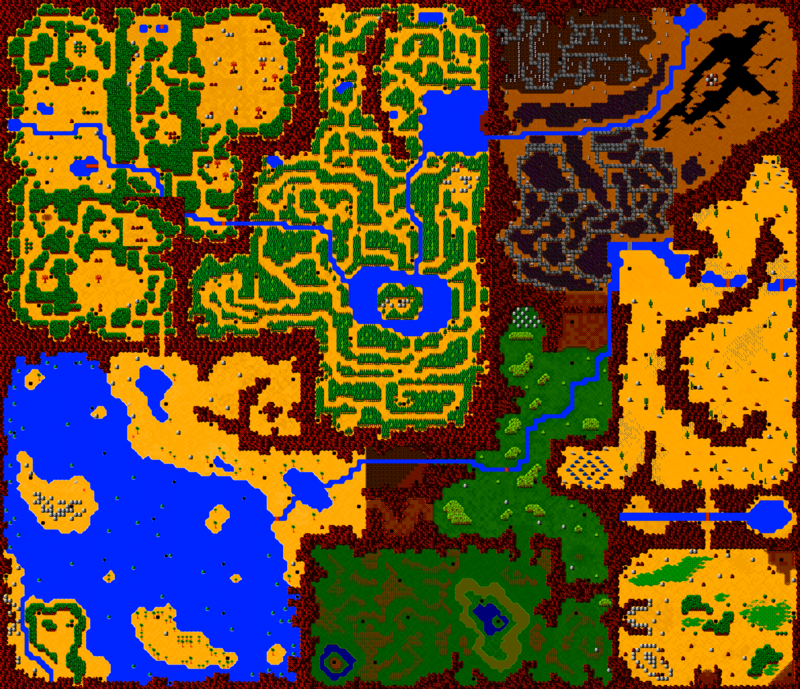 Sometimes it takes a lot of time and effort to make video game maps, whether it's by taking hundreds (or thousands) of screenshots manually, or by hacking some automated process to do it. Either way, if you were not involved in the creation process, it's not fair to submit them as your own. But, you say, a map is a map, and if it's of the same area, it's bound to look the same. That is true, especially in the case of screenshot maps. But I'm not obligated to put up every image I receive, so if I even suspect that a map isn't yours, I don't have to put it up. If I happen to ask you to confirm if you made a map, don't take it personally, as if it was a question of your ability or integrity. However, if you continue to claim a map is yours, and I find valid evidence that it isn't, don't expect me to accept your submissions again, and/or maybe you'll your find forum privileges revoked. There is plenty of evidence to figure out the creator of a map especially if the maps exist elsewhere on the Internet. I do know how to use Google. If I find similar maps, I could check for matching palette choices, the amount of PNG optimization, and more. So don't think you can get away with it. If you were planning on submitting maps that aren't yours, it could be seen as saying that you like someone else's maps enough and that you like my site enough that you think my site should host their maps. Which is flattering. However, to avoid confusion and unnecessary effort, the appropriate way to go about this is to make the mapper aware of VGMaps.com and if they so choose, they can submit the maps themselves. There's no reason why someone capable of hosting their maps would need someone else to submit them on their behalf. If you do submit them on their behalf, even if you say the creators are aware and gave you permisssion, I'm still going to have to email the creators anyway to be satisfied that I can have them up on VGMaps.com. It doesn't help to be a go-between, so don't bother. If you are a mapper, and you are particularly concerned about someone taking your work, putting your name on it somewhere is a simple solution. If you feel that a name or watermark would be intrusive, or that it could easily be edited out, you could write your name somewhere on the map, using a colour that's only one point off of the background's RGB value, so it's almost invisible, but can be revealed in the case of a dispute. Technically that could also be edited out easily, but that would have to be found first. Don't insert metadata, as that will get scrubbed out when I use PNGGauntlet/PNGOut to optimize the image, as I do for all submissions. If you are the type who likes to label your maps, you may find that doing so helps to make a unique map. Even if you want to use the in-game fonts to label things (always looks nice that way), the particular placement of labels, the arrangement of words, etc. can make a map unique enough that if I find this map elsewhere on the 'Net and see the exact same labels in the exact same places then I know whose map it is. But that's only if you plan to host this on your own site and not VGMaps.com. I would encourage everyone to submit any of their own screenshot maps to VGMaps.com, but it doesn't hurt to take precautions to prevent misusage of maps after other people see them here. Okay, I got wordy there. Bottom line is: if it's not yours, don't send it in. RE: DO NOT submit maps that you didn't create yourself! Yep. This is why I did all my own screenshots for my Willow memory map. Since somebody else had already done guide maps for the game, I made sure to use my own custom palette and take all screenshots myself using FCEUX. I'd say at the very least if you're going to use someone else's work, you should give the credit. Better though is to simply ask them first. There was a related incident this week, but I won't go into the details. Other than refusing to post the maps, I may not take any action this time. But now that this topic is stickied, I think it would be fair for me to ban someone if they have the audacity to think they can pull the wool over my eyes. I'm not personally offended just because someone tries to submit maps that aren't theirs, but if I really believe they aren't, find proof, and call them out on it, and they continue to deny it, they must think I'm an idiot and then that's when I get offended. Especially in this particular scenario when they blantantly lied to me more than once. That being said, it would probably be justified if I really wanted to, for example, ban this person from the forums, if they were a forum-goer. But I'll be nice. This time. I would suggest having the contribute button take you to a page that warns people to only submit maps they have created, and from there have an e-mail link button. I'm sure some people just check out the maps and then go to submit something with never looking at the forums. There used to be a contribute page with guidelines and tips in the pre-2006 vgmaps.com. I stumbled upon a map for an old game I used to play - "Govellius" from the sega master system. Under guidelines, can I submit it? Or do I have to go through the long process of creating a totally new map?